Navy SEAL Chris Kyle was credited with 160 confirmed kills in Iraq. If “probable” kills — those without a witness — are added, Kyle’s number rises to 255. He has been called the most deadly sniper in U.S. military history. In director Clint Eastwood’s American Sniper, a sobering big-screen version of Kyle’s autobiography, Kyle says he felt no remorse about those unlucky enough to find their way into his rifle sights. He tells us his regrets involve an inability to protect even more American combatants. Other SEALs and marines called him “Legend.” They felt safer when Kyle was on the job. I don’t know how you’ll feel about Kyle’s warrior ethos, but I do know that Eastwood — with Bradley Cooper hitting a bullseye in the starring role — tells Kyle’s story without doing much by way of moral posturing. By giving us Kyle’s story straight, Eastwood puts the burden on us. We must decide what we think about SEAL culture, the combat mission in Iraq, and the toll that combat takes on the those who fight and the loved ones who support them. American Sniper is that rare action movie that rivets our attention while leaving us with plenty to think about. It’s also staggering to realize that Eastwood — now 84 — took on the arduous task of making an intensely realistic combat movie. As he often has done in recent work, Eastwood skillfully explores the impact of violence on the spirits of those who inflict it. Although, American Sniper doesn’t exactly break new ground, it’s a powerful, unflinching look at the life of a committed warrior operating under especially difficult circumstances. Kyle completed four tours in Iraq. He shuttled back and forth from the U.S. In the process, he lost his taste for ordinary life. Kyle became increasingly isolated from his wife (Sienna Miller) and kids. When he was home, he felt guilty for not being with his comrades in arms. The problems of civilian life seemed embarrassingly trivial to him. He missed the high-stakes atmosphere of combat. As a patriotic man, he felt that as long as shots were being fired at Americans, he should be there. Eastwood portrays the fight in Iraq with a ground-level realism that only a gifted director could achieve. Disciplined and tense, American Sniper is another summary work for a star whose movie career seldom has strayed far from violence. Make no mistake, American Sniper is not Unforgiven, Eastwood’s 1992 anti-revenge saga. American Sniper fully immerses in Kyle’s point of view, which reduces the world to those who prey on others and those who need protection. Kyle believes that being a protector qualifies as a high calling, perhaps the highest calling, something he learned from his dad during his Odessa, Texas childhood. Whether you agree with Kyle doesn’t matter. Had Eastwood made a different movie (one that spent more time wringing its hands about the futility of the war), he could not have taken us so deeply into Kyle’s world. It’s a place we need to visit, and we have a responsibility, I think, to sort through our feelings about it. Eastwood puts us on rooftops with Kyle as he waits for targets to emerge. He’s poised for kills that he believes are absolutely essential. In the context of vicious combat, he’s most probably right. The first of Kyle’s kills involves targets that immediately put him on a strange moral edge: He shoots a kid who’s carrying a bomb and a woman who picks up the same bomb after the kid is killed. Not surprisingly, Kyle wonders whether this is what his harsh SEAL training was all about. He’s quickly assured by a fellow SEAL that the bomb he kept from exploding surely would have killed at least 10 marines. The calculus of war can be that simple. But warriors are also human, and even when they’re not aware that it’s happening to them, the toll of combat settles on their shoulders. Toward the latter part of his career, Kyle began to suffer from post-traumatic stress disorder. An incident at a backyard barbecue in Texas proves harrowing, and it takes Kyle a while to decide that he wants to rejoin society, something that he accomplishes by using his marksman’s skills to help others scarred by war. If I had read Kyle’s autobiography prior to knowing he was to be the subject of a film, Cooper might have been last person I’d have thought of for the lead role. Cooper, after all, is the guy from the Hangover movies, an actor who only began to emerge as a major talent in Silver Linings Playbook and American Hustle. Here, Cooper bulks up to play a good-ole Texas boy whose emotions can’t always support his view of the world as a place where bad people prey on the weak. Cooper keeps Kyle likable throughout, and does an exceptionally fine job of showing that Kyle’s patriotism was real and sincere. Kyle believed he was acting for his country. He couldn’t imagine doing otherwise. You probably wouldn’t want to argue with him about that. Still, a bit of shading creeps into Jason Hall’s screenplay. One of Kyle’s colleagues in combat eventually begins to question the war. When he’s killed, Kyle tells his wife that the man’s doubts about the Iraqi enterprise caused his death. He lost focus. He entertained doubt. To me it sounds as if that man was coming to his senses, but not everyone will see it that way. Kyle certainly didn’t. Kyle’s story clearly establishes the gulf between those who’ve been fighting the U.S’s wars and those who’ve been pursuing normal life at home. These days, war is a specialized warrior’s enterprise. Much of the home front remains oblivious to it. For those who don’t know how Kyle’s story ends, I won’t say more. But the conclusion of Eastwood’s movie vividly demonstrates that for many soldiers, war doesn’t stop when they leave the battlefield. Eastwood knows that when doors of violence swing open, they never entirely can be shut. 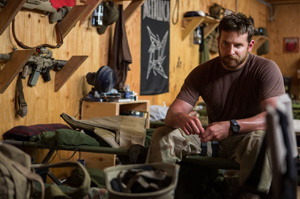 In American Sniper, he again brings us face-to-face with that disturbingly important truth.